People & Animal Learning Services, Inc. (PALS) is on a mission is to promote joy, health, and empowerment through therapeutic programs with horses. But, we think they are also on a mission to make dreams possible! “For my entire life, my wheelchair has always been my mode of transportation. ‘Walking’ away from it on a horse has not only become symbolic of the freedom PALS has given me, but the direction I feel my life has taken since I began taking part in the program.” – Jennifer T.
Jennifer’s story is just one of many incredible stories shared by PALS clients and parents over the years. Since 2000, PALS has provided over 13,000 hours of equine therapy with adults and children with disabilities, seniors, at-risk youth, and veterans. A horse’s unique movement, similar to the natural human gait, challenges the rider’s posture, balance, and righting reactions to improve the level of body awareness and adjustment. These movements, coupled with the warmth of the horse’s body, are often credited for producing physical improvements related to balance, muscle symmetry, motor function, coordination, and posture. Therapeutic riding also impacts self-confidence and enhances cognitive, social, and emotional well being. 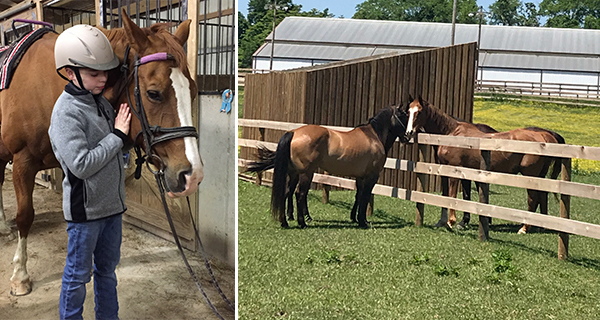 Earlier this year, the Community Foundation awarded a Community Impact Grant to PALS to help fund the construction of new fencing in areas used for therapeutic riding. We’re thrilled to share that this additional fencing will allow PALS to nearly double the number of individuals it can serve. Thanks to the generosity of donors that make Impact Grants possible each year, this grant is about so much more than fencing. It will enable PALS to make dreams a reality for many more children and adults for many years to come! Learn more about the Community Impact Funding Initiative. Read about other Impact Grants awarded this year.